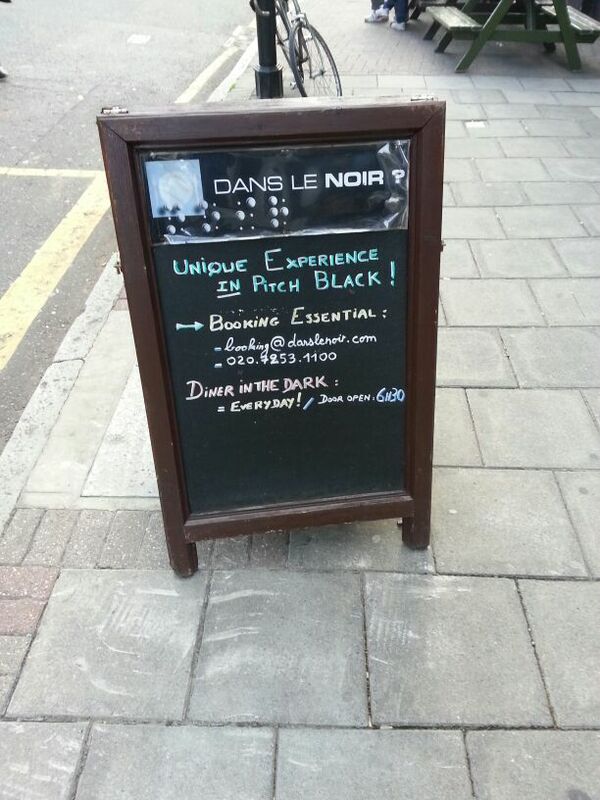 Date Review: Dining In The Dark! “When we first arrived we were greeted by the hostess, who confirmed our booking, then told us to leave our belongings in the nearby lockers, and gave us a card with a number on it. That bar area was very dimly lit, and the hostess gave us a menu to choose our main meal from. There were four choices; Special (an anonymous dish), Meat, Vegetarian or Fish. There is also the choice of having either two courses (starter and main, or main and dessert) for £42, or three courses (starter, main and dessert) for £51. We both chose the meat option, she went for the starter and main, and I had a main and dessert, so that we would share the starter and dessert without having to pay an even heftier price for the three courses. We were also told that we could order drinks beforehand, so we had cocktails. The hostess then took us through a dark corridor (with minimal red lighting) to introduce us to our waiter… He was blind. He told us to form a line, and for me to place my hand on his right shoulder, and Sonya to place her hand on my shoulder too. Then we followed him into a pitch black room, where he told us to stop, so he could lead us to a table one at a time. I was first and I couldn’t believe the way he was able to get me straight there. He told me to feel for the seat and sit down, then he went and got her and led her to the table. He confirmed our food choices, and explained the positioning of the glasses and cutlery. The starter came after what seemed like about 10 mins. It felt like pieces of meat, mixed with salad and some kind of mayonnaise that I kept accidentally dipping my fingers into. It tasted like chopped up pieces of pork, but with a nice smell. You could tell the other customers thought it was just a weird experience, because people kept laughing and joking and playing tricks on each other. The waiter came to clear our table, then he brought our mains about (what felt like) 15 mins later. Don’t forget he’s blind, so the fact that he was doing all this, with no problem, kind of wowed us. From what we could make out, the meat main consisted of one piece of potato and slices of maybe three different types of meat. It was really disappointing, considering the price we’d be paying for it. The dessert that we shared was a small bowl of ice-cream that tasted of various flavours, and passion fruit flavoured jelly cubes. It was nice, but we just couldn’t stop thinking that the cost of the food didn’t reflect the portions. When we were done, the waiter led us out one by one, the same as when we came in. The hostess asked us what we thought we’d eaten, so we guessed and she showed us photos of what we’d ordered. More proof that the meals were small and overpriced. 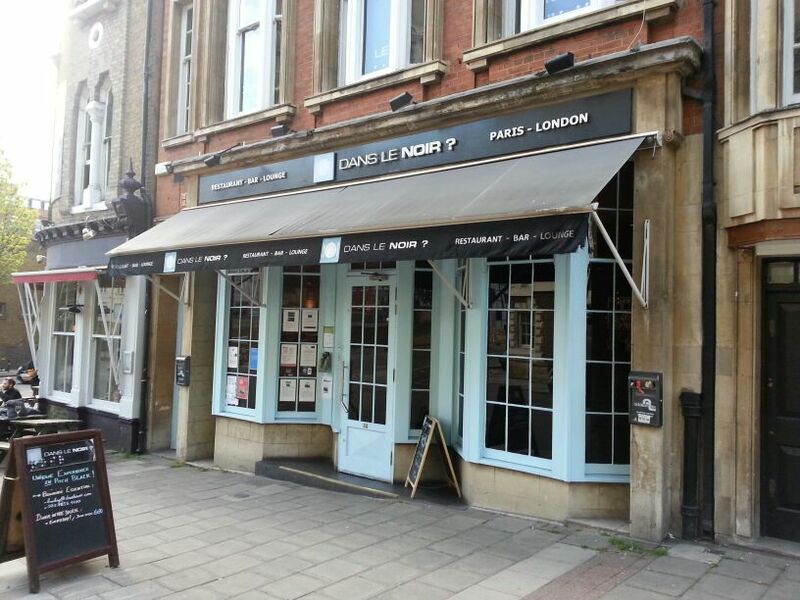 Dining at Dans Le Noir is a good experience, but the let down is the expensive ‘finger food’ sized portions, and also the tables were so close together, my elbows kept knocking the person next to me. I think it’s an experience best shared in a group setting. But on a plus side, you can definitely feel your sense of touch and hearing become stronger. Previous story “We Need To Talk… Or Maybe Not.” Funny Ways People Have Ended Their Relationships!